MakerSlide is a combined framing and linear bearing system. It allows you to quickly create projects that use linear bearings, such as CNC machines. It is based on a standard 20mm x 40mm T-slot extrusion profile. This means you probably won’t have to do any drilling and tapping and there are hundreds of accessories such as brackets and hardware options already available. Also, a lot of CNC specific items like motor and idler pulley mounts can bolt right on. Countless projects have been created including 3D Printers, milling machines, laser cutters, assembly equipment, 2D drawing machines and camera sliders. There are several types of eccentric spacers. Some are actually nuts, rather than spacers, but the generic term of eccentric spacers to describe them all is generally used. They all have an off center hole in them. When the eccentric spacer is rotated that hole will move relative to the mounting hole. This allows you to tighten the wheel against the v rail. This removes the tight tolerance requirements of the mating parts, so they can usually be fabricated using standard tools and simple desktop fabrication methods like laser cutting or 3d printing. Generic plates are also available. Carriages are the little wheeled “cars” that ride on the V feature of the MakerSlide. In most applications these should have at least 3 wheels. One side will have fixed position wheels mounted to 5mm diameter holes. The other side will use 1 or more adjustable wheels mounted on eccentric spacers. Inventables sells standard carriage plates. 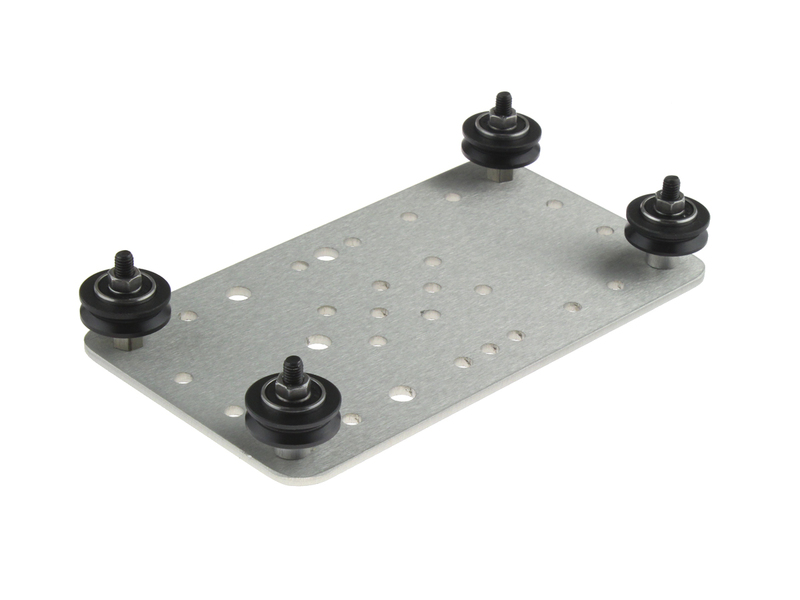 These plate have lots of holes in them that allow you the wheels in many configurations as well as extra holes for mounting brackets and extrusions. Inventables also sell kits to make 3 wheel and 4 wheel complete carriages. If you make your own you need to make sure the dimension of the wheels across the MakerSlide is correct, but as long as you stay within in the adjustment range of the eccentric spacers you are fine. Carriages are often laser cut, 3D printed, CNC routed and even hand fabricated. For the standard 5mm bore wheels, the dimension between the wheel should be 64.4mm. The adjustment range for the eccentric spacers is about 1.5mm. Tips for using 3D printed carriages. A high percentage of fill will prevent the carriage from crushing when the the wheel is tightened. 3-4 passes on the perimeters will give extra strength on the hole walls. If you have trouble with accuracy on hole diameters, try printing them slightly smaller and drilling them to the final diameter. The eccentric spacers with the larger shoulders and longer bosses perform better in softer materials. The V Wheels have two bearings in them. This gives them much more resistance to rocking than a single bearing wheel would have. A 1mm thick washer is placed between the bearings. This allows you to firmly tighten the wheels without putting any load on the bearings. The pressure from tightening the mounting screw is only felt by the inner races of the bearings. The washer might slide off center and block the hole as you are installing it. Just use something pointy like pen or pencil to recenter it. The bearings are maintenance free with rubber seals and should never to be lubricated unless they are exposed to a strong solvent. Mechanical Strength and Wheel Loading. The wheel loading varies greatly from application to application. Wheels can be loaded at any angle. The highest loading can be achieve when the wheel is used vertically, like the wheel on a car. In general it is best to keep the load to 4-6 lbs or less per wheels. MakerSlide can be cut many ways. You can use manual tools like hacksaws or power tools like band saws, chop saws or tables saws. The best quality cut for smoothness, squareness and burr free is done using a simple power chop saw with a carbide toothed blade. A cheap, low tooth count blade will work fine. Be sure to use eye and ear protection because it will be loud and metal chips will fly around. Here is a video show how easy it is to cut. One method that is highly discouraged is using a abrasive cutoff saw or wheel. Aluminum does abrade away cleanly and will just gum up the wheel and make a horrible cut. The V Wheels are generally adjusted using eccentric spacers or nuts. These spacers have an off center hole that moves towards or away from the v feature on the MakerSlide. What about longer lengths of MakerSlide? Flatness of profile areas: 0.004"
Surface finish: V features are free of any scratches or dents. Here are some notable projects using Makerslide. Steel wheels can be run on Makerslide, but the aluminum may wear over time. If you hardcoat anodize the MakerSlide it will last a long time with steel wheel. Inventables does not offer this coating at this time, bu most urban areas have many anodizers who can apply this coating. Unfortunately shipping longer pieces than currently available is not practical. MakerSlide was not really designed for large machines anyway. Joining MakerSlide at the ends. Joining MakerSlide pieces into a longer rail can be done. The strength of the joint will not be as strong as rest of the extrusion and joining should only be done when the joint is not under stress by supporting either side of the joint. The smoothness of the transition is generally good, but depends a lot on the quality of the cuts on the ends. See the section above of cutting MakerSlide to get the smoothest and squarest cuts. You can use your own fastening method or use these mending brackets. To get near perfect alignment you can insert some 4.2mm dia rods into the holes in the center of the MakerSlide. Glue them into one side, then slide the other piece on. If you are planning a large project or have a large volume of a custom length we might be able connect you directly with our extruder. By large, we are talking close to 1000 lbs. There are setup times and costs that make doing smaller runs impractical. There is also a long lead time of 4-5 weeks. You would need to arrange the shipping to a raised dock with fork lift on your own. The saving is significant and the factory can ship to your exact dimensions and apply the clear anodize after the cut. We can also arrange large orders of the components, but large orders are measured in the thousands and have a 4-5 week lead time. This arrangement can only done for specific projects and not for the sale of raw materials and individual parts. Contact us if you are interested in this arrangement.